or is the wiring a piece of cake that a drunk 5 year old with a beer in his hands can do it? how long should i expect this to take? a weekend? so its something i can do in an afternoon then! It's been done many times so there's lots of info out there. Hack off the stock plugs and wire in one or two new ones so you can still unplug the dash that you make up. EVS??? you can do it in a afternoon as long as you got the new panel cut and ready to go with all the gauges wired up. Then all you have to do is use male and female connectors and wire them up. You will also hae to extend the wiring on the harness so you can take the gauges in and out easier. 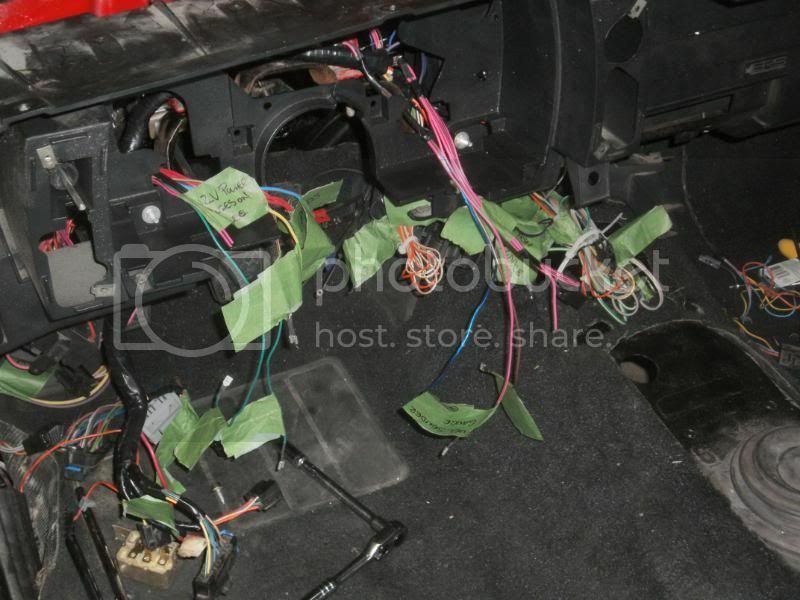 Heres a pic of my wiring when I put it back in the car. You can see where I extended it and how many there are. There are 5 12v switched, 3 or 4 grounds, 3 cluster illumination, and the rest are singles for the gauges. Its really easy to do as long as you have patience and some time.